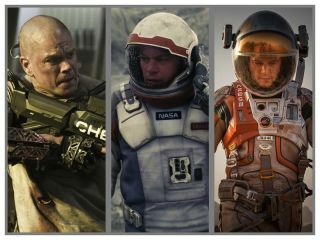 Matt Damon appeared in (L to R): "Elysium," "Interstellar" and "The Martian." Matt Damon has become a Hollywood A-lister by taking on roles in big-budget action films and dramas, but could he become known for his science fiction work instead? This Friday is opening night of "The Martian," which is the third major science fiction movie starring Damon in the last two years. In 2014, Damon played a supporting role in Christopher Nolan's space epic "Interstellar." In 2013, he starred in "Elysium," a story in which extreme class divides have sent wealthy people to live on a Shangri-La-esque space station orbiting Earth. In "The Martian," Damon plays astronaut Mark Watney, who is mistaken for dead and left behind on Mars by his crewmates. He must find a way to survive on the inhospitable planet before a rescue mission can reach him. In "Interstellar," Damon plays an astronaut who has willingly traveled to an unexplored planet to find out if it could host a colony of humans. Scott mentioned Damon's concerns about the similarity between the two roles during a panel discussion following an early screening of "The Martian" on Sunday, Sept. 27, in New York City. "I think he was concerned that he'd done ["Interstellar"] and that he had been isolated on a planet [in that too]. And he said, 'You think that matters?' and I said, 'I don't know. I need to see the film ['Interstellar,']'" Scott said. "I saw it and thought, 'Nah, the film's great, but I don't think it connects in that way.'" Oddly enough, Damon's co-star in "The Martian," Jessica Chastain, was also in "Interstellar," although the two never shared a scene in the latter movie. In "The Martian," Chastain plays the captain of the Mars crew that accidentally leaves Watney behind. In "Interstellar," she plays a brilliant physicist working on a problem that may save the human race. Damon was attached to "The Martian" from early on, even before Scott was chosen as the film's director. In an exclusive interview with Space.com, we asked Damon if he was worried that the amount of science in the movie might make it a little too geeky. "I think the book does a very good job of, you know, [Weir] doesn't go too deep into the weeds. At least, he doesn't lose someone like me, and I'm really a layman," he said. "So that's what we really wanted to retain with the movie. We wanted it to feel like the science wasn't beyond any of our capacity to understand. And hopefully the movie audience will get a kick out of it — you know they're going to understand the problems that [Watney] has to overcome, and watch him overcome them." Will Damon go for a fourth and fifth science fiction film in the near future? We've got our fingers crossed.